As the Western Amateur, one of the great and storied amateur events in our game’s history, plays out this week at Skokie Country Club in Glencoe, Illinois, I wanted to wish the talented field of players the best of luck. No matter what your future holds as players, the Western Amateur is a great training ground and will be a special experience for you. I know it was for me. Throughout my life, I’ve always had a tendency, as the British neatly put it, to squeeze a quart into a pint pot. Maybe this is overconfidence, or maybe it’s just a strong desire to live life to the fullest. Whatever the cause, I’ve always been in the championship flight when it comes to filling up a day. What with marriage, college, three jobs, then, in the fall, impending parenthood, I remember the year 1961 taking on a distinctly blurred character. Nevertheless, it ended up pretty satisfying so far as golf was concerned. In those days, following the weather-enforced winter layoff from sustained practice in my hometown of Upper Arlington, Ohio, I would usually begin working intensively on my game with PGA Professional Jack Grout at Scioto Country Club in early February. If it were not too cold or windy, we would hit balls outdoors, if necessary clearing a patch of snow or packing it down and hitting off the top. In really bitter conditions, we’d become wimps and work from the open-ended Quonset hut. Come Spring Break, I would head down either to Pinehurst or Florida for more intensive practice, plus generally a warm-up tournament. The warm-up tournament in 1961 was the Western Amateur, played in New Orleans at New Orleans Country Club. 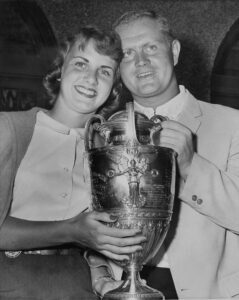 It was that year that match play rounds were reduced to 18 holes and the current five-day format was adopted, with four matches on last two days. I won the final, 4 and 3, defeating Billy Key. The Western Amateur was founded in 1899—making it the world’s third-oldest amateur championship behind the British Amateur (1885) and the U.S. Amateur (1895). To this day, as the 115th Western Amateur is played, it holds up as one of the most prestigious titles in the amateur game. Soon after winning the event, I took low amateur honors in the Masters, tying for seventh—seven shots behind Gary Player—and ignited a legacy I’m very proud of at Augusta National.